Shuttle-themed M&M's: Melts in your mouth, not at your final space shuttle launch. 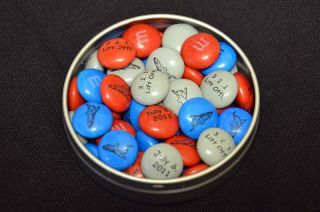 These M&M candies were presented to members of the final launch team and astronaut crew for NASA's STS-135 mission in July 2011. In the hours that led up to NASA's final space shuttle launch last Friday (July 8), the launch and mission control teams, as well as the astronauts flying on board shuttle Atlantis, received a sweet surprise: special space shuttle-themed M&M's candies. The red, blue and silver "candy-coated chocolates" – as NASA has generically labeled them ever since they flew aboard the first shuttle mission in 1981 – were in small metal tins. Marked with their trademark "m" on one side, the candies were decorated on the reverse with either a small image of the shuttle orbiter, the phrase "3... 2... 1... Lift Off!" or the date of the launch, "July 8, 2011." "We've been honored to fly on more than 130 missions with hundreds of American heroes over the last three decades," said Debra Sandler, chief consumer officer for Mars Chocolate North America, whose products include M&M's. "It's bittersweet to see this program, which has inspired millions to reach for the stars, come to an end, but we wish the crew of Atlantis a safe and successful mission," she said in a statement. The STS-135 astronauts — commander Chris Ferguson, pilot Doug Hurley and mission specialists Sandy Magnus and Rex Walheim — received M&M's personalized with their names. NASA astronaut Loren Shriver eats M&M's candy in weightlessness aboard the space shuttle Atlantis during the STS-42 mission in 1992. One of the most well-known examples of the off-the-shelf foods flown on the space shuttle, M&M's have been eaten on the winged spacecraft since the STS-1 crew requested them on shuttle Columbia when they lifted off on April 12, 1981. The candies' small shape and colorful assortment have made them a favorite for astronauts, not just to eat but to play within the microgravity environment on the shuttle. It has been a common sight over the past three decades to see shuttle crew members tossing the M&M's between them, catching them in their mouths, or playing Pac-Man — chomping on a floating line up of the candy pieces. A memorable photo taken in 1992 of STS-46 commander Loren Shriver showed the astronaut attempting to catch the floating sweets as he hovered in front of space shuttle Atlantis' window overlooking the Earth below. The M&M's retained their letter "m" markings, though. The candies remained more or less generic until astronaut Shannon Lucid spent 188 days aboard the Russian space station Mir in 1996. When asked what she missed most back on Earth, she replied from orbit, "I guess the only thing that would be nice is to have a few more M&M's." Her confession led to both the NASA Administrator and President of the United States presenting Lucid with many pounds of M&M's upon her landing on the space shuttle. The Mars Chocolates company also packaged red, white, and blue M&M's to give to her and visitors to the Kennedy Space Center. M&M's will continue to be consumed in space aboard the International Space Station. Space shuttle Atlantis, flying this final shuttle flight, has the almond-variety on board, or "candy-coated almonds." The crew's personalized M&M's remained on the ground. Continue reading at collectSPACE.com about other pop culture and corporate tributes to the end of the space shuttle program.